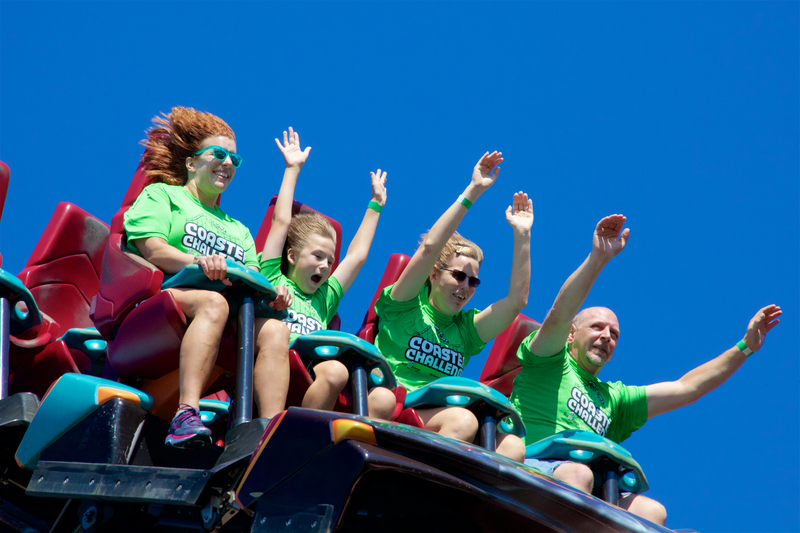 Special Olympics Illinois hosted the 5th Annual Coaster Challenge on September 15, 2018, at Six Flags Great America. The event included over 170 registered participants who raised more than 56,000 to benefit Special Olympics Illinois. Participants registered and fundraised, and were able to ride the distance of a 5K, 10K, Half Marathon or Marathon on Six Flags Great America’s world-class roller coasters. 2018 Coaster Challenge Ambassador, Bryce Giron gave a speech to the group as well as event organizer Jen Marcello. All Coaster Challenge participants received early entry to the park and were able to ride the Whizzer and Raging Bull before the park opened to the public. All participants received a Flash Pass to all roller coasters in the park once the park opened to the public. Once participants completed their ridding distance, medals were awarded, and participants were able to stay and enjoy all the benefits that Six Flags had to offer. Thank you to Six Flags Great America, Daily Herald, Chicago’s B96, Outfront Media, and Chicago Bucket List for sponsoring this event. Fundraisers like the Coaster Challenge help to sustain the mission of Special Olympics into the next 50 years.